As the sun came up, the prairie was populated with seedheads wearing little snow caps. Unfortunately, for whatever reason, I couldn’t seem to find a single one that photographed well. So, I ended up with this photo of milkweed seeds, in which you can’t even really tell it was snowy. But trust me, it was cold. 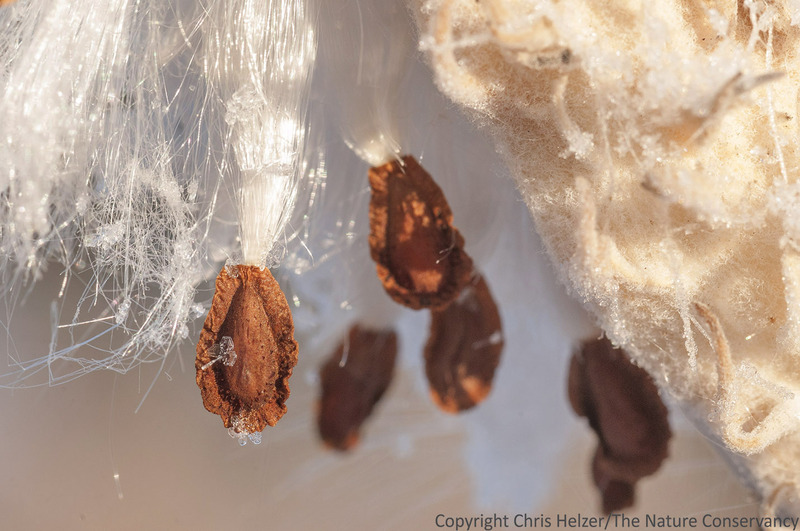 Common milkweed seeds on a frigid, snowy day. The Leadership Center Prairie, Aurora, Nebraska. Oh, and by the way – I took several versions of this photo and struggled to decide which I liked best. You might ask, “Chris, why don’t you just put a couple versions up and ask us which we like better?” Sure, that’d work great. I tried that yesterday with the bison photos. Twenty four hours later, well over 100 people voted, some contacting me outside of the blog, and the vote was almost exactly evenly split. A number of you tried to have it both ways, so your “vote” didn’t really help. The remainder of you did, at least, express an opinion, but in the end, there was no consensus. This entry was posted in Prairie Photography, Prairie Plants and tagged close up, cold weather, grassland, great plains, macro photography, milkweed, milkweed seeds, nebraska, photography, prairie, seeds, snow, winter by Chris Helzer. Bookmark the permalink. Chris – out of curiosity, how close was your lens to the subject? I have a lot to learn with my macro, and even the slightest breeze makes things tough. I’m finding that manual focus is the way to go when you’re in close. Mike, I’m not sure, but I think probably 8-10″ from the subject. I was using a 105mm lens on a DX camera, so it functioned like about a 160mm lens – giving me some space to work with. I definitely rely on manual focus for most close-up work. The only exception is in very low light where the camera can sometimes “see” better than I can. Even then, I try it both ways to be sure I get it right. I have 100mm lens and 1.6 crop camera so similar setup to yours. Last full moon I tried it, and as always, a lot more to learn from my first time trying it. I think a wide open area would be much better but I still enjoyed taking mine. Pics on my site if you want to take a look. Having somewhat unsteady hands, I always hold my breath when I take photos. Nice shot of the milkweed, I think I can see some snow in there. Yeah I was on the winning team by a nose. well actually the side view gave a better nose was the other one. well both are winners thanks for sharing it was close that is the way i read them too! close! 12 here today! Definitely the right choice to include both bison photos, as each was excellent, but for different reasons. After all, would you restrict yourself to having just one photo of your old uncle on the piano? Mike I just watched the video you posted, it is very nice. I have done a few shots with the full moon but nothing like these. Chris, glad you decided to use both images uncle or not.